Isn't She Loverly is an ode to the classic My Fair Lady. Loverly is a muted orchid pink holo with bronze micro flakies, turquoise-purple-pink ucc flakies, more holo and a dash of faux unicorn pee. This sells for $12 and has no cap. In case you haven't guessed already the theme for August is Musicals. The application for Isnt She Loverly is wonderful. Smooth formula with even coverage and a high opacity. I had no VNL after the first coat and the flakies lay flat against the nail. Shown here is two coats plus glossy top coat. The flakes evenly disperse on the nail without any manipulation. If I was to complain about anything it would be that the high opacity causes the flakes from the first coat to get covered up by the second. But trust me I'm not really complaining about anything. It's just something I noticed about this polish. I should have applied 3 very thin coats to help the flakes be more visible. That's a trick I recently learned but keep forgetting to put into practice. Does that ever happen to you? 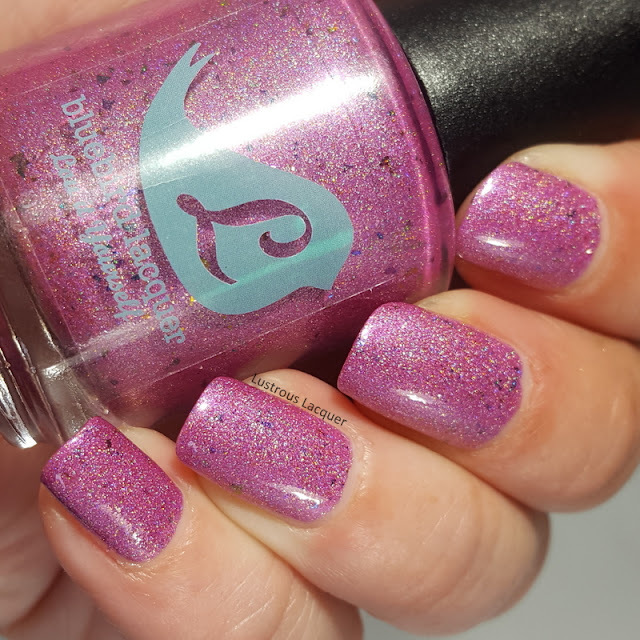 Isn't She Loverly is available right now for purchase from Polish Pickup Pack for $12. Although there is no cap on this item you need to act fast before the opportunity to own this is gone. Make sure to visit the site by Aug. 6th to get yours. Thanks for stopping by and Happy Polishing!